Cassper Nyovest is known in South Africa for many things, including (allegedly) “biting” – but not in the way you think. “Biting”, in the world of rap and hip-hop is the term used to describe an artist producing a track that sounds like a known track produced by another artist. Some artists call it “paying homage”, but there’s a fine line between paying homage and infringing another person’s intellectual property (in this case, copyright) rights. Cassper is allegedly the South African hip-hop industry’s poster boy for biting. And he has been criticised for this. But recently Cassper has found himself on the receiving end of “being bit”. Over the last 3 years he has hosted a series of concerts under the trade mark “#FillUp”, including “Fill Up The Dome”, “Fill Up Orlando Stadium” and “Fill Up FNB Stadium” and he alleges that he has built up a significant reputation in the #FillUp brand as a result. Suffice to say he was not happy when Tsonga music star Benny Mayengani recently put on a show under the banner “Fill Up Giyani Stadium”. Nyovest’s manager has told newspapers that he has trade marked the #FillUp brand and a search of the South African Trade Marks Register reveals that he did, in fact, file an application to register #FillUp… back in 2016, however, the Register shows the application as still pending. It is also interesting to note that on 10 September 2018, days after the dispute between Nyovest and Mayengani hit the newspapers and social media scene, an application for the trade mark HASHTAG FILL UP (#FILLUP) was filed in the name of Lehlohonolo Blessings Answer Ramoba in class 41, the same class as Nyovest’s application. It is not clear though, whether this individual has any relationship to Mayengani or Nyovest. So, what is the lesson in all of this? If you want to build a brand, one of the most important steps in doing so is to register your trade mark. The first step is to conduct a search of the Trade Marks Register to ensure that your trade mark does not infringe anyone else’s registered rights. Provided that the results of this so-called clearance search are favourable, the next step would be to file an application for registration, which Cassper Nyovest has done. But this is not where it ends, as you can only take action for trade mark infringement once your trade mark is actually registered. After a trade mark application has been filed, it must be examined by the Registrar to ensure that it complies with all the relevant formal requirements and that the trade mark does not conflict with a prior application or registration in the name of a third party. After examination the Registrar will issue an examination report indicating whether the application will be accepted and, if so, whether there are any conditions that must be fulfilled before the application will be formally accepted. After acceptance, the application must be published to allow interested parties to oppose it, should they wish to do so, and it remains open to opposition for a period of 3 months after the date of publication. Only after that, and provided that no opposition is raised, will the trade mark actually proceed to registration. In South Africa the entire process from filing to registration takes between 1 and a half and two years, assuming that the process runs smoothly and there is no opposition. It is also important to remember that trade marks are territorial and that a trade mark that is registered in South Africa is enforceable in South Africa only. If the trade mark will be used in other countries, it must be registered in those countries. With all of this in mind, it is a good idea to engage the services of a specialist trade mark attorney to assist with the trade mark clearance and registration process. 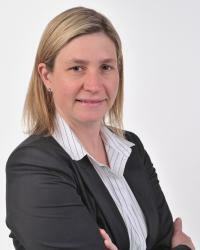 Vicky Stilwell is a director and trade mark attorney at KISCH IP. Vicky has more than 13 years’ experience in the field of intellectual property, specialising in all areas of trade mark and copyright law.